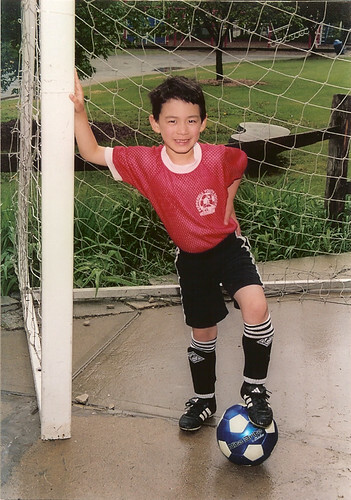 This spring, I petitioned my town's soccer league to allow Adam to play in the U8 (under 8) division even though he missed the cutoff and was still six years old. His previous coach gave him a great recommendation and thankfully he really thrived in the new environment. On good days, he scored 3 goals a game against his 7- and 8-year-old opponents. I’m certainly aspiring to be a soccer mom extraordinaire and really appreciate this interview. I’ve been team parent for 2 seasons now and really enjoy being part of the community soccer scene. Coaching is definitely out of my league as I have nearly no athletic skills, although I have a close mom friend who does it and really enjoys it. I also know a woman on my woman’s ice hockey team, who only started playing at the age of 46 and now is an excellent player and coaches her son’s hockey team. She got her skills by attending all the same hockey camps together with her son. Now that’s dedication. In our town, we have both the in-town and traveling soccer teams for U10, but only traveling teams above that. Right now, my son being six was supposed to be in U6, but I lobbied to have him start U8 early, where he is flourishing. His coach starting talking to me about the travel teams for next year and was surprised when I told him that he was only 6. I hate to be labeled one of those ambitious pushy soccer moms, but I was only trying to put him with players at his level. The other kids in U6 were not getting equal play time and fun when he was regularly scoring 8 goals a game. I have the feeling that the traveling teams do receive top billing in our town and will probably have my son tryout when he is old enough (but not before this time). One thing I did not expect however, was when some of the older kids on Adam's team got into a fistfight during practice. I only heard about it secondhand from another mom, since I was busy chasing Dova around that day. Apparently, there was a boy on Adam's team that was taller than the rest of the kids and a very good ball handler as well. He was not a good team player though and always took the ball down the field without passing so he could score. During this practice, the coach's son tried to get this boy to play fair and stole the ball and took it down the field. The other boy then jumped on the coach's son and threw three punches, right, left and an uppercut. The coach immediately pulled the boy off and yelled "That is not acceptable!" The mom who witnessed this was shocked to see something that violent. She looked around and saw that everyone else missed the incident and thought she was in a twilight zone. She did spot the boy's dad rolling his eyes saying "Not again..." Again? This has happened before? The boy sat out for the rest of practice and at the end the coach spoke to his dad. Apparently under pressure, the dad asked his son to apologize or else he wouldn't get to play on the team. The son refused. The dad started getting animated to show that he meant business but the boy kept refusing. They eventually left without an apology. After practice, the mom went to the coach to let him know that she was moving her son to a different team because she didn't want him playing with this boy. The coach said no, no, you don't have to do that, we'll figure something out. What the league figured out however, was to move this boy off the team and into U10. So this is how they deal with unacceptable behavior? By rewarding him with a promotion? I was extremely disappointed to hear about this decision. Sure, he was bigger and better, but soccer is a team sport and his behavior is only going to get worse. He should have been suspended. I hate to even think that Adam could be involved in fights of this nature at his age. But as long as there are clueless parents, there will be clueless kids. I might have to comment twice in this post since I have not finished reading it but have work staring me in the face! I agree that moving the boy up to the older league does seem like a "promotion", but on the other hand....he will NOT be the largest kid there, and his attitude has GOT to change because everyone else up there probably has the ability to take care of any of his problems themselves. Gee...I'm in a particularly agressive mood....I'm not sure if it comes out in my writing.....must be the bug that I'm working on...it is sitting right there "taunting us"!